While the Insignia Guide states that this emblem is not for uniform wear, the Whittling Chip patch is considered a "Temporary Patch"
or on a patch vest, blanket or outer wear. Scouts who earned it while in Cub Scouts may also wear it on the BACK of a merit badge sash. Know the safety rules for handling a knife. Show that you know how to take care of and use a pocketknife. Make a carving with a pocketknife. * Work with your den leader or other adult when doing this. Read, understand and promise to abide by the "Knives Are Not Toys" guidelines. 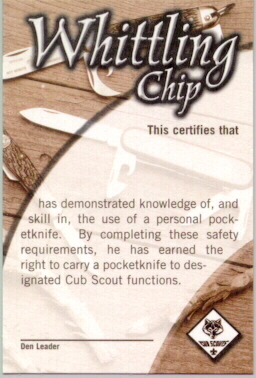 Read, understand and promise to abide by the "Pocketknife Pledge." may be used to fulfill Whittling Chip requirement 3. I will treat my pocketknife with the respect due a useful tool. I will always close my pocketknife and put it away when not in use. I will not use my pocketknife when it might injure someone near me. 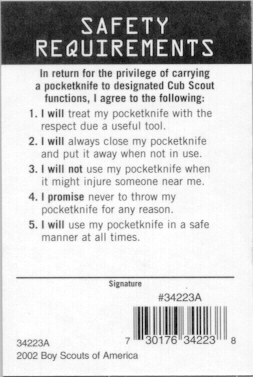 I promise never to throw my pocketknife for any reason. I will use my pocketknife in a safe manner at all times. Close the blade with the palm of your hand. Never use a knife on something that will dull or break it. Be Careful that you do not cut yourself or any person nearby. Never use a knife to strip the bark from a tree. Do not carve your initials into anything that does not belong to you. Know how to sharpen a knife. A sharp knife is safer than a dull knife because it is less likely to slip and cut you. When you are using the cutting blade, do not try to make big shavings or chips. Eay does it. Make a safety circle. Before you pick up your knife to use it, stretch your arm out and turn in a circle. If you cannot touch anyone or anything else, it is safe to use your knife. While using your knife, be sure to watch in case someone walks toward you and gets too close.